Live trapping opossums is the best way to get rid of opossums from your home, business, or office area without harming the animal or anyone around. Drivin Me Batty has trained staff that set and bait safe and humane live traps to properly catch opossums from your property. Once the opossum is in a trap one of our wildlife control technicians will return to relocate the animal to ensure that it will not return. Opossums are scavengers, and they often visit human homes or settlements to raid garbage cans, dumpsters, and other containers. They are attracted to carrion and can often be spotted near roadkill. Opossums also eat grass, nuts, and fruit. They will hunt mice, [p2p type=”slug” value=”michigan-bird-removal-services”]birds[/p2p], insects, worms, snakes, and even chickens. There are more than 60 different species of opossum, which are often called possums. A female opossum gives birth to helpless young as tiny as honeybees. Babies immediately crawl into the mother’s pouch, where they continue to develop. As they get larger, they will go in and out of the pouch and sometimes ride on the mother’s back as she hunts for food. Opossums may give birth to as many as 20 babies in a litter, but fewer than half of them survive. Some never even make it as far as the pouch. 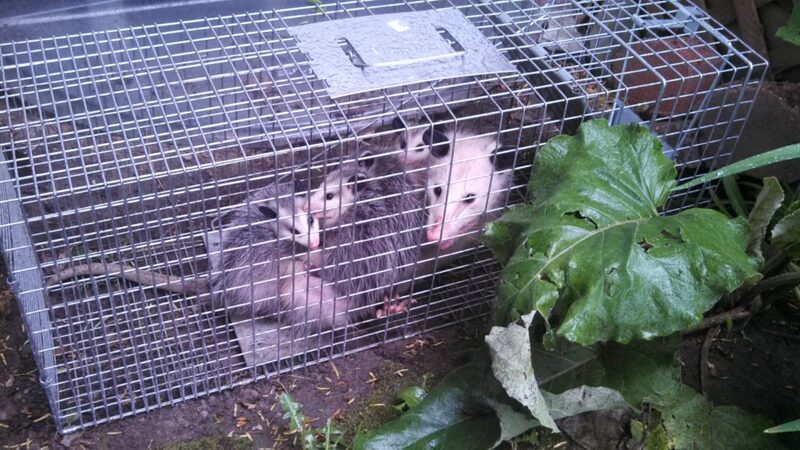 Call Drivin’ Me Batty to [p2p type=”slug” value=”live-animal-trapping”]live trap [/p2p]and remove your opossum problems from your home or business. Our professional nuisance animal wildlife management services cover all of Mid to Southeast Michigan.